As most of you know, I’m a California-grown farm girl, proudly wearing boots in the field on my family’s ranches in the center on the Golden State. So, y’all can imagine how excited I was when the folks from CA Grown asked me to create an ecookbook full of simple, seasonal recipes highlighting all the goodness raised here. Of course I included gluten-free versions of every dish, and you can download it (Free!) right here. 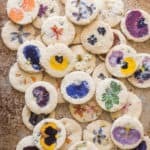 These pretty cookies are featured in the cookbook, and they’ve become one of my favorite recipes. California is America’s leading producer of high-quality cut flowers and greens – growing over 75% of all domestic cut flowers in the United States. That includes culinary grade flowers, so when you see an orchid on your dessert or a snapdragon in your salad, there’s a good chance it’s California Grown. 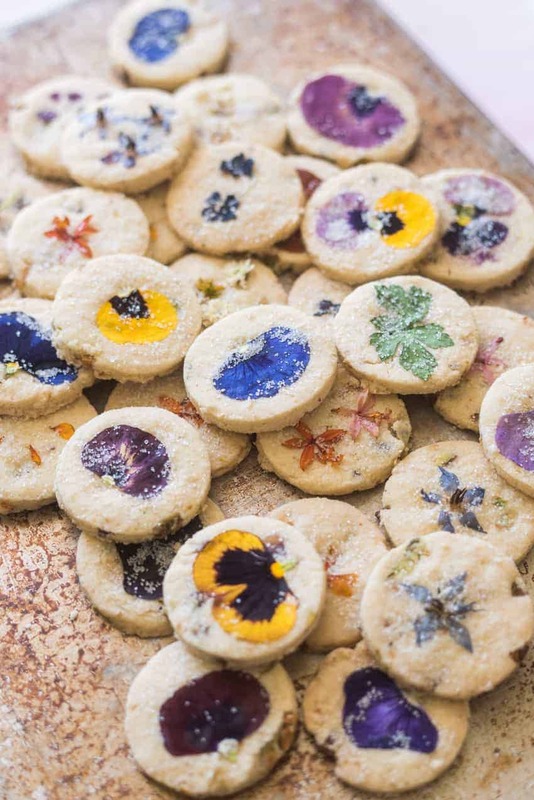 Inspired by Chef Lori Stern’s Instagram-sensation edible flower cookies, these buttery-crisp shortbreads feature pretty green flecks and fabulous crunch courtesy of pistachios. Many varieties of flowers are edible, but you’ll want to be certain the ones you’re using are culinary-grade, meaning they’ve been grown and packed in conditions that are food safe. You can order edible flowers online, or from some florists or grocery stores. Farmer’s markets are also a great source for edible blooms. 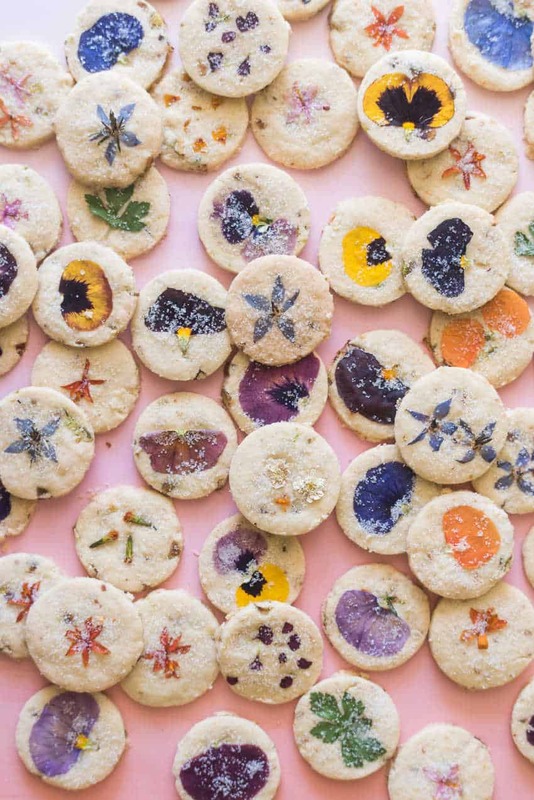 These buttery-crisp shortbreads feature pretty green flecks and fabulous crunch courtesy of California-grown pistachios and gorgeous edible blooms. Preheat the oven to 375° F. Line a rimmed baking sheet with parchment paper and set aside. In a large bowl, whisk together the flour, sugar and salt. Create a well in the center of the dry ingredients and add the butter, mix with a spoon until combined. Scatter the pistachio pieces over the dough and knead with hands until the dough comes together and is smooth. Wrap tightly with plastic wrap and chill for at least 10 minutes. Remove dough from refrigerator and place between two sheets of parchment paper. Roll dough to about 1/4 inch thickness and cut out cookies with a 1 1/2 inch round cutter, and place them on the lined baking sheet. Artfully place the flowers or individual petals on the cookies and press gently into the dough. Bake on the center rack of the oven for 10-12 minutes, until the edges turn slightly golden. Remove from the oven and sprinkle immediately with sugar, then allow to cool. Note: Cookies may be kept at room temperature in an airtight container for 3 days. If your gluten-free flour blend doesn't contain baking binder, add 1 tsp to the flour before mixing. Sponsored by California Grown. All opinions are my own. But you knew that. This entry was posted in Baked Goods, Desserts, Recipes and tagged baking, california, cookies, gluten free baking, gluten free holiday, gluten free holidays, holidays, kc cornwell. Bookmark the permalink.